Some title. Nobody not of the persuasion could possibly have come up with such a barbed description. Nobody else could have got away with writing such a withering – and yes, shocking – account of Jewish family dynamics than someone deeply embedded in its layers of acrimony yet still have the chutzpah to call it `a comedy’. Joshua Harmon says the title came to him seven years before the play ever got written. It popped into his head as a title for a play but it took another few years of living before it grew into hard reality. Now Bad Jews has become an all-time favourite in the US which in itself says something. Bad Jews is hardly the best advertisement for members of the faith but my goodness it lays out arguments for and against Judaism and its religious rituals, non belief and marrying out with extraordinary even-handedness. And it does so via two of the most feisty, obnoxious protagonists you’d want to imagine being part of any family circle! Daphna played with unalloyed gusto by Jenna Augen (like a whirlwind Barbra Streisand in The Way We Were only with about ten times more cajones) is pitted against Liam (or Shlomo), her tense, nervy cousin (Ilan Goodman practically in meltdown mode) at a moment in their lives which sends them flying off into stratospheric recrimination and bile. The moment, triggered natch by the death of their grandfather – trust a funeral to show family relationships and feuding in their worst possible light – spirals out of control, exacerbated by questions of religious loyalty, Holocaust legacies, marriage proposals, Christian girl-friends and much more. Harmon is absolutely extraordinary in the way he gradually piles on the pressure and is able to pounce on a mounting series of flashpoints that seem to erupt out of seemingly inconsequential comments or emotional reactions. Coruscating to witness, and as directed by Michael Longhurst in a production first aired in Bath, with a wonderful sense of pace that gives phrases and words time to sink in before another subterranean emotional mine explodes in our midst, it culminates in an act as shocking as it is unexpected – an expression of faith driven, you’d have to say, to a point of fanaticism. Uncomfortable as it is to watch – the comedy lies in the extent to which the extremities of offensive bad-mouthing strike you as amusing – Harmon must feel there are certain truths about the conduct of the grandchildren of Holocaust survivors he wishes to expose, albeit lovingly for all the heat and intensity expressed, and to show them running into deep water. Indeed almost out of their depth. Augen and Goodman are beautifully supported by Gina Bramhill as Liam’s sweet goy girlfriend (who sings Gershwin’s Summertime in a style that runs Florence Foster Jenkins very close for off-key brilliance) and Joe Coen’s laid back but conflicted Jonah, younger brother to Liam. 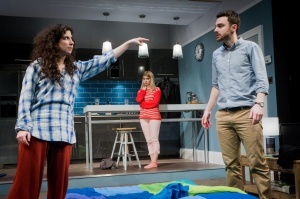 Bad Jews, as provocative as it is vituperative, I suspect is set to make waves for a very long time to come. Get a gander whilst it’s still fresh. This entry was posted in 2015, Reviews and tagged Jewish comedy, Joshua Harmon, Michael Longhurst, St James' Theatre on February 1, 2015 by Carole Woddis.